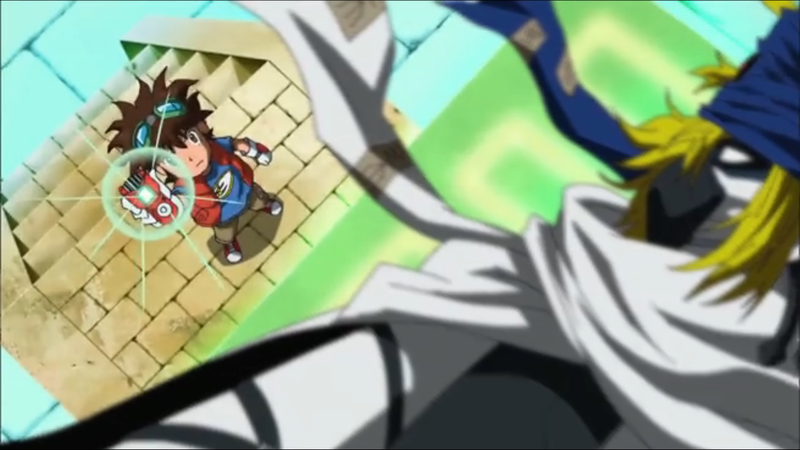 Last time, there were a few things missing in Reapmon's turn to a good guy and inevitable sacrifice. We missed the realization that his quest for vengeance strayed him from the path. We missed his conflict over helping Mikey despite resenting the queen continuing to overlook him. We missed that single frame where it all comes to a head. Everything we asked for comes through here as the trusty quarter-pole proves to be as brilliant for Fusion as it has been for the previous five seasons. It would have been outstanding even if the previous episode had gotten it right, but in spite of their failings the previous Sand Zone episodes successfully set the stage and allowed Fusion to finally get a defining moment of its own. It has to be said that it's refreshing that the moment Reapmon turns on Laylamon, she doesn't waste any time returning the favor. Why bother with hurt feelings and a long speech about betrayal when you can deliver a sneak attack while he was unprepared? Again, it's a sign of just how little patience Bagramon's generals had with Reapmon. The cruel nature of the attack adds to Laylamon's villain credibility, even though it was a rather logical move for her. Logic continues to evade the Fusion Fighters, but all bets are off when disembodied ethereal Pharaohmon tells Mikey that the code crown allows him to recreate the spiritual healing place of the Warriors of Light. It's the first time a code crown has even been able to do something tangible to its world, but if we're to believe they offer anything more than symbolic control of a zone, they probably should be capable of stuff like this. 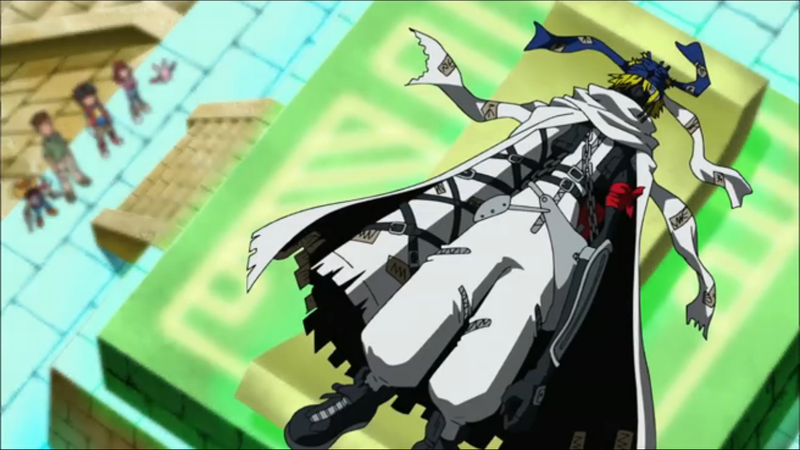 After everything Reapmon did to help Mikey, it's quite understandable that Mikey would want to help him in return, especially since he had just assembled a giant floating pyramid for that express purpose. At first glance, the protective barrier would buy time for Mikey's digivice to work its magic. It's only after Laylamon's army starts breaking the barrier and the process ends up needing all of the Fusion Loader's processing power does everyone come to realize he's gotten in too deep again. But by this point Mikey's too committed to the operation to abort and mount a proper defense. Once Machinedramon shows up and eats the barrier, the situation becomes truly unwinnable and Mikey really is stuck. He either has to turn his back on his team, who promised to hold the line without him but simply can't, or Reapmon, whom Mikey is close to healing but is only doing so out of a sense of obligation. Mikey's decision to continue helping Reapmon comes from trusting that his team will pull through. That's what Shoutmon doesn't get initially; Mikey is favoring Reapmon because he needs the most help, and that he believes the collective army can take care of business themselves. 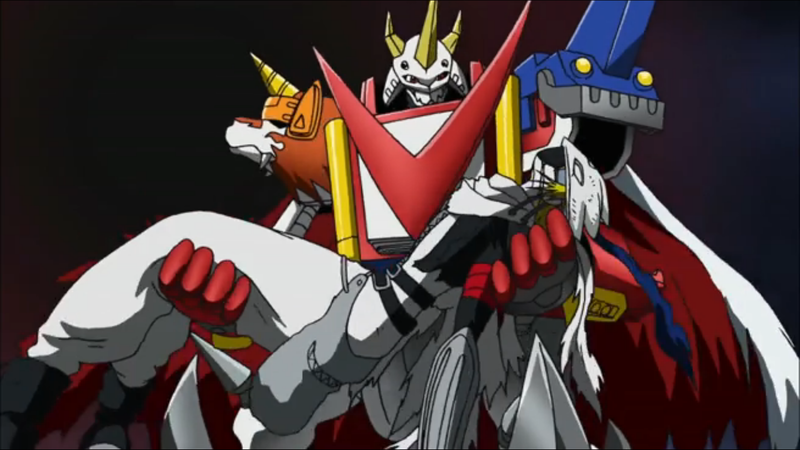 Of course, despite Shoutmon's renewed resolve, that's just not happening. Mikey's kinda stuck here, forced to either turn tail and abandon Reapmon or see the job through at the very real risk of losing his army. Reapmon's the one to figure this out and stop the process. After all, if Mikey and his team were to fall here, then Reapmon's help would be for nothing. That's what probably earns him approval from the queen after all this time. It's not about putting the past behind him. It's about understanding that his response should not have been to avenge his fallen friends, but rather to do everything possible to make sure his new ones don't meet the same fate. It's actually pretty fortunate that the Fusion Loader expelled the entire team before starting the recharge process. The initial wave of SkullScorpiomon required numbers, and Mikey may not have remembered that folks like Beastmon or Knightmon were ready to go. Gotta love that the renewal imagery is that of a hard drive rebooting. Jeremy's dial-up line fit well... although you have to wonder if he's old enough to remember what dial-up was. Shoutmon quips about dinosaurs being large and not around anymore. The hell's he talking about? It's the Digital World; there are dinosaurs everywhere. Given the size of Machinedramon's cannon, would Reapmon's jumping in front of the attack have been enough to shield Shoutmon X4K? That thing looked like it could have ripped through several bodies and still taken a good chunk out of the pyramid.